Getting ready for the fall? You need some hot trends in your wardrobe! 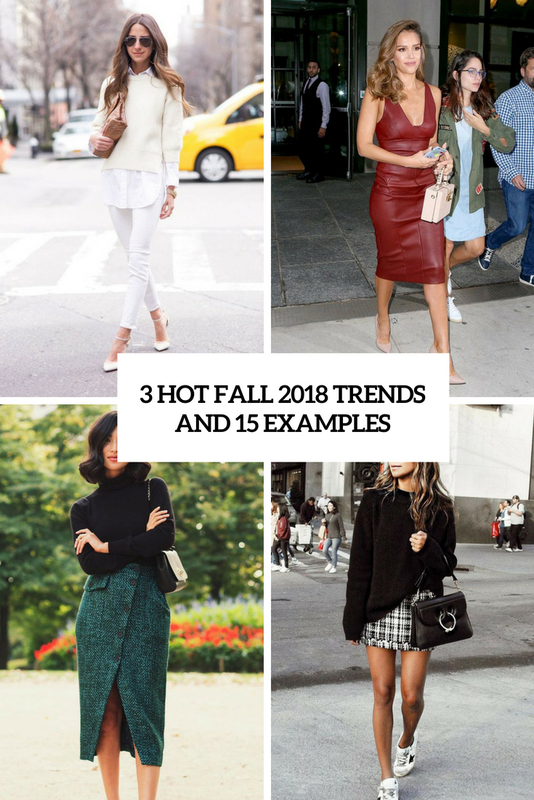 Here are three top trends for fall 2018 outfits, take a look! A leather dress isn’t clothes for everyday but it’s amazing for various events, dates and formal cases. All the stars and celebrities are already rocking leather dresses of various colors and length, most of them are of course sheath ones to highlight the curves. Try the best leather colors that accent the material: burgundy, red, black, emerald, brown and grey. When everything is pale around and everybody’s wearing dark colors, there’s nothing cooler and easier to stand out than wearing white. Rock any clothes you like, in white, off-white and creamy shades creating layered looks for more warmth and coziness. Create all-white looks not only for every day but also for work, too, rocking a white pantsuit with a white shirt, heels and a trench. Tweed is a timeless thing, which is great for fall and winter every year but especially this year and many celebrities and fashionistas are already wearing it. Tweed blazers, skirts, pants are worn with various sweaters and turtlenecks plus catchy boots. Don’t forget that tweed adds a formal touch to your look, so if you feel like casual, pair it with sneakers and tees.